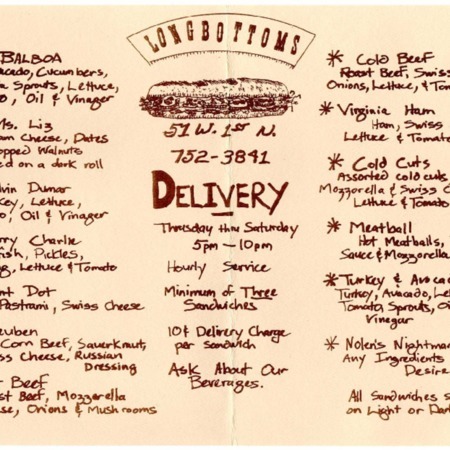 Menus for Longbottom's Delicatessen. Sandwiches include: Balboa, Ms. Liz, Melvin Dumer, Sorry Charlie, Aunt Dot, Reuben, Hot Beef, Cold beef, Virginia ham, Cold cuts, Meatball, Turkey and avacado, and Nolen's nightmare. For delivery minimum of three (3) sandwiches and from 5 pm to 10 pm. Open for lunch at 11 am. Informal dining. 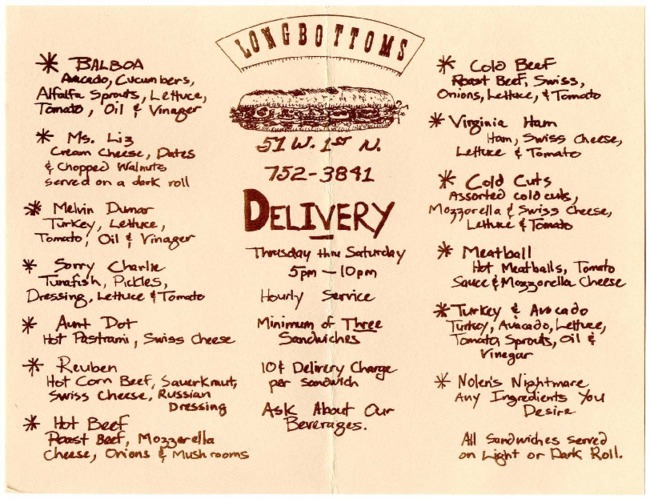 “Longbottom's Delicatessen menu, 1978,” Highway 89, accessed April 22, 2019, http://highway89.org/items/show/10267.